In May, as expected, the U.S. Food and Drug Administration (FDA) published two proposed regulations in the Federal Register, both arising out of the Bioterrorism Act of 2002. One of the proposals concerns FDA's new authority to detain an article of food suspected of being contaminated. The other concerns the record-keeping requirements the Act imposes on the food industry and FDA's new authority to demand access to those records. Hopefully, most food manufacturers won't encounter FDA's authority to detain contaminated food, and this regulation will be referred to only infrequently by food industry lawyers. The recordkeeping proposal, on the other hand, is something that will impact daily operations. Manufacturers will need to review their current recordkeeping practices to determine what, if any, changes will be required by the proposal and the final rule when it is published. This would include the content of records, how they are maintained, and the length of time they are maintained. What follows is a basic introduction to the two proposals. FDA has long enjoyed the authority to seize any food that is "adulterated" or "misbranded" while in interstate commerce, or after shipment in interstate commerce. In recent years, however, FDA has come to view the seizure action as procedurally cumbersome and an inefficient means to police food safety. Seizure actions must be brought by a local United States attorney acting on behalf of FDA, and they are governed by arcane rules for admiralty and maritime claims. As a result, actual seizure actions have become relatively rare. Following the Bioterrorism Act, FDA's traditional authority to seize adulterated or misbranded food remained intact and was supplemented by the new administrative detention authority. This new authority applies in more limited circumstances. Specifically, it applies only when FDA has "credible evidence or information indicating that such article presents a threat of serious adverse health consequences or death to humans or animals." This goes beyond mere adulteration of food (e.g., contamination that may render the food injurious to health). The threat must involve a serious adverse health consequence. Note also that FDA only needs "credible evidence or information," not proof, to act under its administrative detention authority. This authority is intended to empower FDA to respond very quickly to a contamination incident. Presumably, the extent and nature of contamination, if any, will be further investigated while the food is under detention. The procedures FDA must follow in ordering a detention under its new authority are vastly simpler than those followed in a traditional seizure action. According to its proposed regulations, FDA would simply issue a detention order to the owner, operator, or agent in charge of the place where the article of food is located. The detention order must include certain specified information, including a brief statement of the reasons for the detention. Any person who would be entitled to claim the detained food may appeal a detention order and request a hearing. One noteworthy aspect of FDA's administrative detention authority is that one is hard-pressed to imagine a scenario in which this authority would be strictly necessary to respond to a suspected act of deliberate contamination. Any business entity in possession of a food or food ingredient that is implicated in an act of terrorism would almost certainly offer full cooperation to federal authorities. More likely, FDA will use or threaten to use its administrative detention authority against food that may have been contaminated under more mundane circumstances than terrorism, such as run-of-the-mill filth, microorganisms or chemical impurities. At that point, it might be debated whether the Bioterrorism Act was intended to empower FDA with detention authority over accidentally contaminated food upon only "credible evidence or information." In an economic impact analysis it published with the proposed rule, FDA notes that the criteria for Class I recalls are similar to the criteria for administrative detentions. In addition, FDA states that administrative detentions may replace Class I recalls. This clearly signals the Agency's intent to apply its administrative detention authority in situations not involving intentional acts of food contamination. It seems likely that (1) FDA will prevail in any dispute about the scope of its authority in this regard; and (2) most food manufacturers holding food believed to be contaminated will cooperate with the Agency in any event. In a nutshell, the Bioterrorism Act accomplishes two things with respect to recordkeeping. First, it grants FDA access to records regarding an article of food when FDA has a reasonable belief the food is adulterated and presents a threat of serious adverse health consequences. Second, it states that FDA may establish regulations that require the establishment and maintenance of records to identify the immediate previous source and the immediate subsequent recipients of food. FDA's proposed regulation seeks to fill in many details regarding its access to records and the scope of the new recordkeeping requirement. 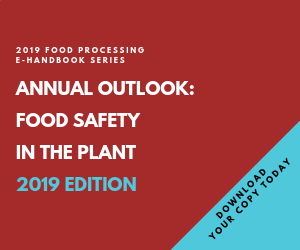 Most food manufacturers already keep records that allow for the identification of the source and subsequent recipient of foods, with ingredients and finished products identified according to lot number. However, manufacturers should review FDA's proposal and assess the need to revise their recordkeeping practices accordingly. Regarding the scope of the recordkeeping obligation, at least two questions arise: Who must keep the records, and what qualifies as "food" for which records must be kept? The proposal applies to "domestic persons" who manufacture, process, pack, transport, distribute, receive, hold, or import food intended for human or animal consumption in the United States. "Food" is defined for this purpose as it is elsewhere in the Food, Drug, and Cosmetic Act to include finished food as well as components of food. Thus, the recordkeeping obligation extends well beyond manufacturers of finished food. It also includes, for example, manufacturers of food additives and warehouses where food additives or ingredients are stored. In addition, "foreign facilities" that manufacture, process, pack or hold food for human or animal consumption in the United States are subject to the proposed rule. In short, foreign facilities that are required to register under the separate facility registration proposal are required to comply with the recordkeeping rule as proposed. FDA's ability to enforce the recordkeeping requirements against facilities located outside the United States is questionable. However, in the event of a serious contamination incident involving an imported food offered for sale in the United States, or a food containing an imported ingredient, FDA can probably expect a reasonable degree of cooperation, particularly if the manufacturer has a reputation to protect. Several types of facilities are exempt from the proposed recordkeeping rule. These include farms, restaurants, certain fishing vessels, retail facilities, and facilities that only handle foods regulated exclusively by USDA (meat, poultry, eggs). Regarding the content of records that must be kept, FDA proposes a specific list of information that must be maintained for all food handled by a covered facility. For example, a facility must record the immediate previous source of each food or ingredient it obtains. This must include an adequate description of the food, the date it was received, and its lot code, among other information. Separate requirements are established for persons who only transport food. The records must be created at the time each activity occurs (e.g., receipt or transportation of food). They must be retained for a period of either one or two years. The one-year retention time applies to animal food and to perishable foods not intended for processing into nonperishable foods. The two-year retention time applies to all other foods. The records must be maintained at the site where the covered activity occurred, or at a reasonably accessible location. FDA does not have free access to the records. Only when FDA has a "reasonable belief that an article of food is adulterated and presents a threat of serious adverse health consequences or death to humans or animals" may it inspect these records. Even then, FDA may only access those records that are needed to assess whether the food in question is adulterated and presents a threat of serious adverse health consequences. Again, this is not explicitly limited to food suspected of having been deliberately contaminated. Interestingly, FDA does not appear to have authority to demand access to these records during a routine plant inspection, even for the purpose of confirming their existence. Most likely, this won't stop FDA inspectors from requesting access to these records during routine inspections. Facilities required to maintain these records would have the right to decline access unless FDA states a reasonable belief that an article of food is adulterated and, again, presents a threat of serious adverse health consequences. It is a "prohibited act" to (1) fail to establish and maintain the required records; or (2) deny FDA access to the records when the availability requirement is triggered by a contamination incident. When a person commits a "prohibited act," FDA may respond with criminal prosecution or a civil injunction action. FDA is accepting comments on both proposals through July 8, 2003, only two months after their publication. All operators in the food industry are encouraged to study the proposals and consider their impact. FDA proposes that the recordkeeping rule would go into effect six months after publication of the final rule, with longer deadlines available for small businesses. FDA's administrative detention authority is already in effect although it has not yet been exercised at the time of this writing.